The most important part of swine production is in knowing the correct way to feed pigs. Whether browsing through a piglet feeding guide or studying swine management techniques, pigs need a high energy diet that is low in fiber that contains ample protein. Pigs will consume enormous amounts of food quickly. To raise and maintain a healthy stock, maximize growth and reproduction, and increase production, it is necessary to feed them the right food and a balanced diet from wean to finish. Though pigs will eat just about anything, all kinds of scraps, or leftover food such as bread, other grains, vegetables, and fruits, their growth rates are best maintained when the animals are fed a feed made specifically for pigs. Foods high in sugars can slow growth rates while milk, meats, and fish can harbor viruses. Pits and seeds of apples, pears, apricots and peaches contain a naturally occurring substance called amygdalin which is a cyanogenic glycoside that is released when chewed causing illness, discomfort, or even death. Potatoes contain natural toxins called glycoalkaloids, which can cause severe stomach ache or even death (though rare), and also contain solanine which destroys red blood cells, causes diarrhea, and heart failure. Formulating a good pig feed will help achieve optimum growth of your stock. Feeds should meet the animal’s needs for maintenance, growth, and reproduction, and contain sufficient energy, protein, minerals and vitamins. Farm grains are the most common and best source of food to feed pigs. Most typically corn-based feeds are used because they are high in digestible carbohydrates, low in fiber, and cost effective. The feed should be supplemented with other vitamins, proteins, and some antibacterial compounds to their feed to slow the growth of naturally occurring bacteria that may be harmful to the animal or your stock. Feeds mixed with rice bran, broken rice, maize, soya-beans, cassava, vegetables and distillers’ residues have shown positive results. A pig’s food and water requirements change as pigs grow. Piglets, younger pigs that weigh less than 40 pounds, should be introduced to a solid diet through creep feeding while they are still suckling. Dietary needs will increase daily with a pig’s weight. 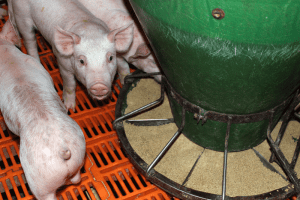 Growing pigs, those weighing 40 to 125 pounds, and finishing pigs, those weighing 125 pounds to market weight (approximately 230 pounds or more) should transition from the grower feeds that are nutrient dense with more protein to the finisher feeds that are less dense. Because a pig eats approximately 4% of its body weight per day, they require a number of essential nutrients to meet their daily needs, i.e., water, carbohydrates, fats, protein (amino acids), minerals, and vitamins. With a proper diet, expect weight gains of about 1.5 to 1.7 pounds per day up to approximately 110 pounds. After that, weight gains of 1.8 to 2.2 pounds per day. To maximize feed intake, a number of other factors need to be considered as well. This includes temperature and environmental control, adequate supply of water, and sanitation control programs. 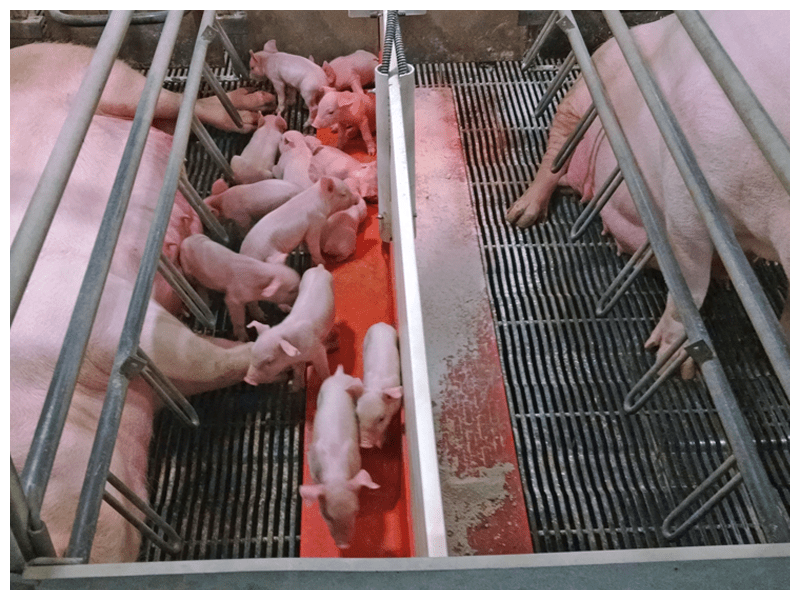 Pig temperature requirements are important to growth and production. Pigs are a highly adaptable animal and can perform well within a range of temperatures. However, temperatures too low or too high can have adverse effects on stock. If, for example, temperatures are too cold, a pig will feed more but expend more energy to stay warm, resulting in slow growth. Hot weather can lead to heat stress and reduce feed consumption (and can possibly lead to death), so it is important to keep livestock cool in summer. Consequently, growth and mature rates slow, conception rates fall, and pig flow is reduced, disrupting stock levels. Depending on the season, keep buildings well-ventilated or heated, and provide adequate air space within the pen to ensure pig growth and production rates are maintained. Provide lots of fresh, clean water. Water is the central part of a pig’s diet. One-half to two-thirds of its body weight is water. Access to clean drinking water is essential to a pig’s growth rate. Newly weaned pigs are especially prone to dehydrate. However water is supplied, water devices must be sanitized and properly positioned. Pigs must have water readily accessible for drinking throughout the day to maintain proper hydration. Implement sanitation protocols. Poor sanitation can lead to undetected disease challenges that reduces food intake. Properly designed feeders will encourage maximum feed intake. Osborne has been providing innovative pig feeders and livestock equipment since 1973. Our success has been built on the quality of our products and the increased efficiency and growth rates they make possible. If you’re interested in expanding the capabilities of your hog production facilities, contact the experts at Osborne today!